Pom wears a rather fetching and comfortable cardigan with four yellow buttons and has a toy called Pim. They go on adventures together. Throughout the story they encounter scenarios that are both good and bad luck. Pom likes to share their good fortune with Pim and equally needs Pim when things are not going so well. The story has a lovely flow of good luck/bad luck/good luck/bad luck which finally results in a shared happy experience. The story will also help any child who has experienced a loss of a burst balloon and finds an imaginative way of using what is left. The fear of a popping balloon may actually turn in to a feeling of excitement with opportunities for children to use their imagination to invent new uses for old items. 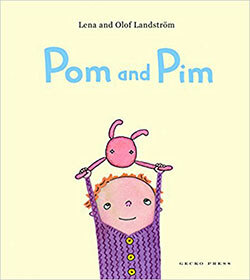 Pom and Pim is a picture book with simple illustrations and a few carefully chosen words which have been translated from Swedish. The story is jaunty and fun taking the reader through good luck and bad luck scenarios seamlessly. When Pom finds a balloon (good luck) after a little lie down from a tummy ache (bad luck) there is an opportunity for the reader to pre-empt and consider what might happen next, especially when some nasty looking thorns appear on the edge of the page. Pom appears to be gender fluid and so all children can relate to him/her. I see him as a boy whilst my daughter sees her as a girl which has been a useful way of discussing gender which was an unexpected delight. Sometimes when we feel that things are going wrong, good things can then happen making a difficult experience a happy one. With a little bit of imagination, treasures that get broken can be transformed and re-cycled into something wonderful with a new lease of life. We all experience bad luck and good luck in our lives. This story shows us the silver lining in bad times. Pom experiences bad luck by falling over a stone, but good luck as he lands on money. He then buys an ice-cream with his good fortune but then gets a tummy-ache. When laying down to rest he sees a balloon which makes him want to go back outside, but it pops (good sound effect can be made here when reading!). Pom then can make a raincoat for his toy Pim and enjoy this re-cycled invention in the rain! Pom and Pim recycle a treasure after a journey of good and bad luck. Pom shares his good times and bad with his toy Pim.